Spicy radishes offer great flavor and crunch in this light (yet filling!) 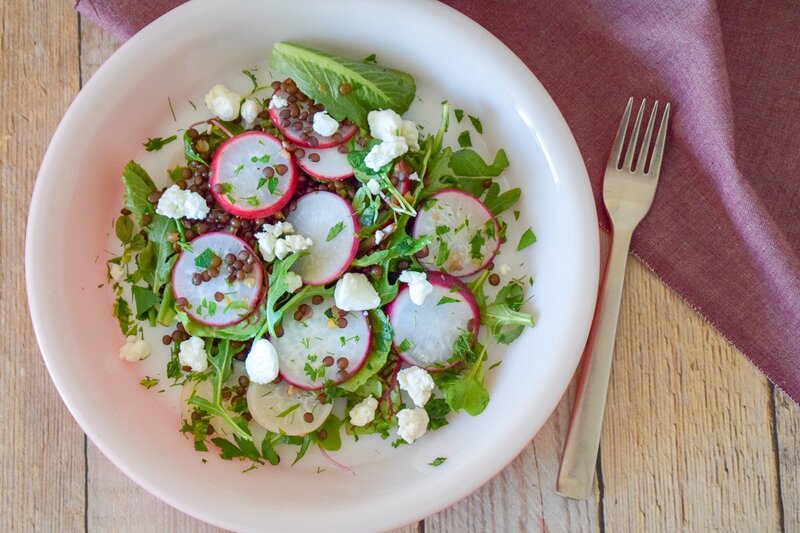 lentil salad, balanced with creamy goat cheese and fresh greens. 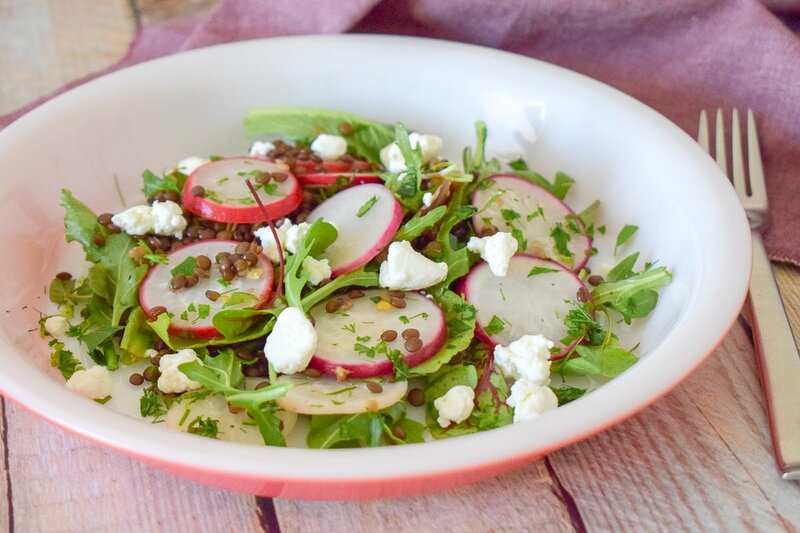 This lentil salad with radishes and fresh herbs and greens is the perfect “transitional season” meal. The radishes light and crisp, but the lentils add some heft, so it is still filling. Mixed with a handful of fresh greens and some goat cheese, this salad has something for everyone. For this salad, I used black beluga lentils. I love their size, texture, and color contrast against the white radish rounds. Feel free to use any lentil you have on hand — green or brown lentils would also be great! Marinating the radishes helps to tone down some of their harsh bite and helps the flavors of the salad meld together. 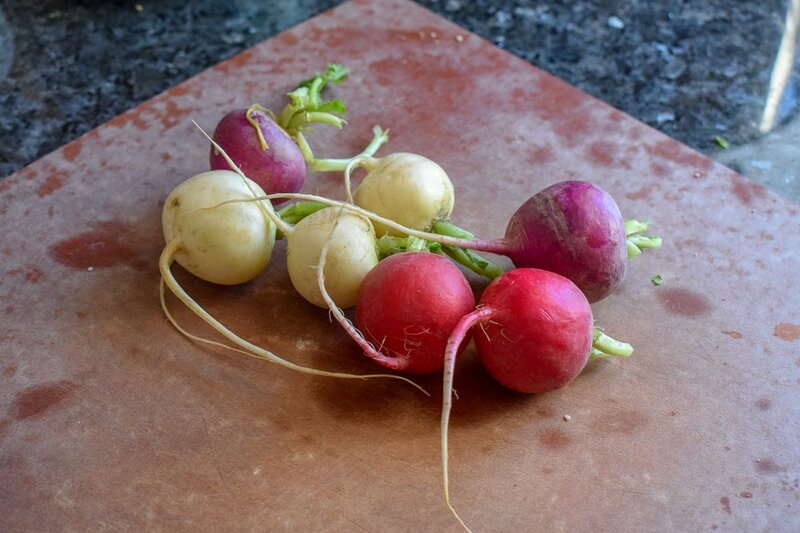 I found a beautiful bunch of Easter egg radishes, but any variety will do! 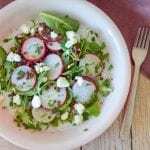 As soon as I get my hands on some pretty purple radishes I will be making this recipe again. How are you preparing for spring? Let me know in the comments! Put a medium pot of salted water on to boil. Once boiling, add the lentils and reduce to a simmer. Cook according to package directions, about 20 minutes, or until the lentils are tender. Drain well and set aside to cool slightly. While the lentils cook, combine the sliced radishes, vinegar, and olive oil in a bowl. Season with salt and pepper, then toss to coat. 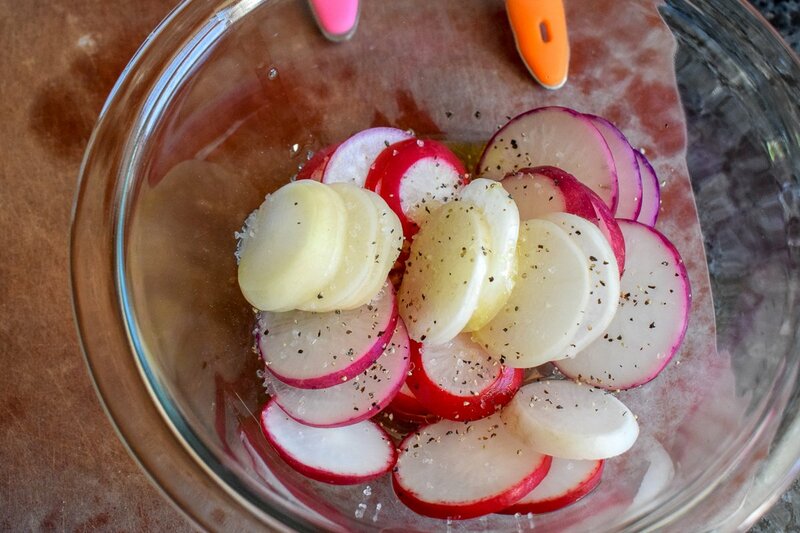 Allow the radishes to marinate for at least 15 minutes, tossing occasionally. Add the cooked lentils to the marinated radishes and toss to coat the lentils with the dressing. Divide the salad between two plates and top with the goat cheese. Garnish with the remaining herbs. 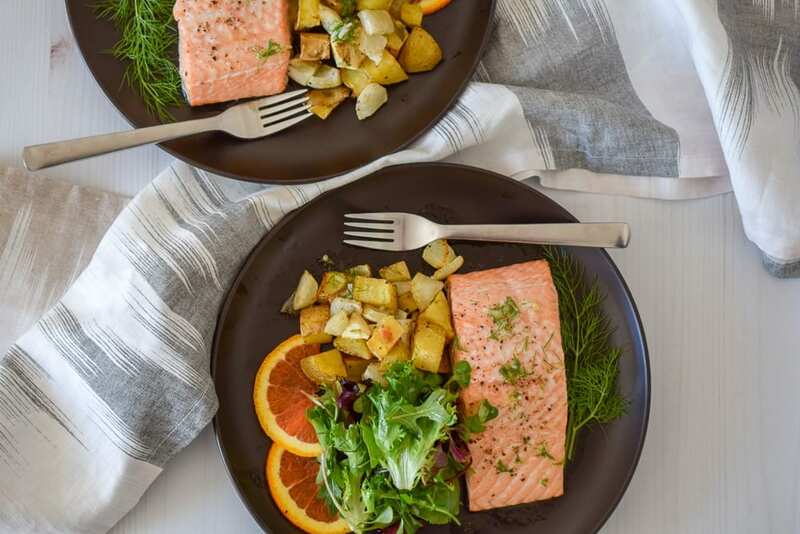 This recipe works great with any herbs you have on hand! I used parsley and fennel fronds, but tarragon, basil, and oregano would also be delicious! 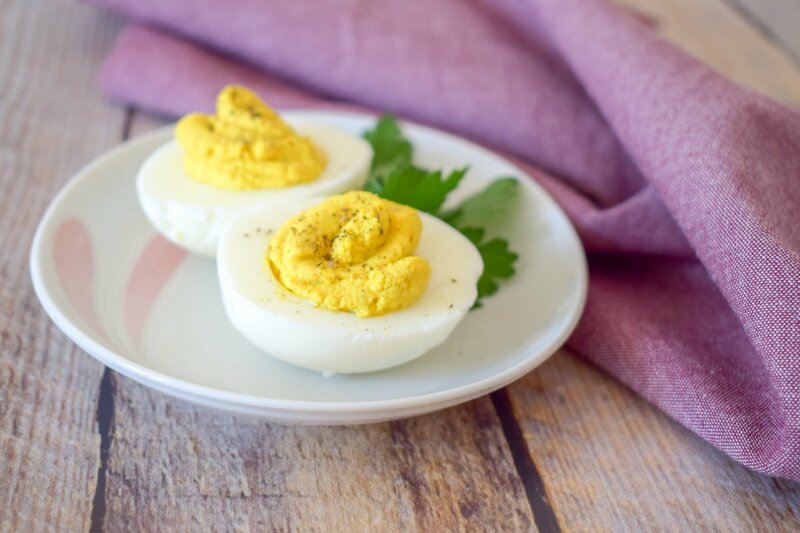 I’ve always been a fan of radishes – going to have to give this recipe a shot to use up what I have leftover from another recipe! Yes! Always looking for ways to use up leftover ingredients. Looks fabulous! Going to try this with my home grown radishes this year. Do you have any good roasted radish recipes?